The original DiST® (Dissolved Solids Tester) was first introduced in 1986 by Hanna Instruments . Since then, the measurement of Conductivity and Total Dissolved Solids has never been easier. The DiST®s ease-of-use, in combination with its affordability, made it the standard in EC and TDS measurement. Hanna Instruments continues the tradition of innovation with the DiST®5. We at Hanna Instruments have always valued the comments and suggestions coming from our customers. For this series, we have included all the features you have asked for and more! The DiST®5 includes features such as a replaceable graphite electrode, adjustable TDS ratio, temperature in °C or °F, automatic temperature compensation with adjustable ß, battery level indicator, stability indicator, automatic shut-off and automatic calibration all in a floating, waterproof casing. 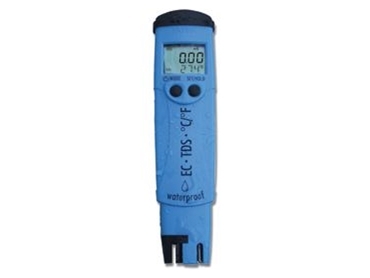 This 3-in-1 tester is unmatched in EC/TDS/Temperature measurement! HI 98311 (DiST®5) is supplied complete with protective cap, batteries, probe removal tool and instructions.